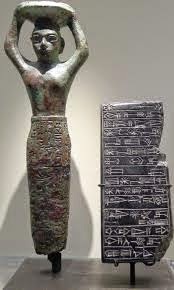 A tablet and a copper statue of King Ur-Nammu, found at Nippur in Iraq, dating to approximately 2100 B.C.As the Sumerian city-states began to grow and flourish, a need for order began to arise, so the kings issued uniform laws, rooted in precedence, and applying to all citizens. The earliest evidence of this was two tablets uncovered from the city-states of Ur and Nippur from around 2100 BC, issued by the king Ur-Nammu. They contained about 17 ordinances that outlined various offenses, and the penalty for each one. Among the inventions of the Sumerians, the most persistent and far-reaching was their invention of this above law called "The Code of Ur-Nammu" . While all cultures have some system of social regulation and conflict resolution, law is a distinct phenomenon. Law is written and administered retribution and conflict resolution. In early sumeria,legal disputes followed a set course of action. Before reaching court an attempt was made to settle the matter between the parties involved.This process was presided over by an arbitrator known as a maskhim.Failing that the dispute was brought to the court were a panel of professional judges, known as dikuds, heard the arguments. By 2400 B.C. laws were common on Sumerian society. These laws were designed to protect the weak, poor, widows, and orphans against the rich.Ur-Nammu is also credited as the builder of the Great Ziggurat of Ur.Unlike what would come later, such as the popular “eye for an eye,”[The Code of Hammurabi] these early laws focused on providing monetary compensation for harm done. The task of administrating justice rested with the king, but his duties often made it impossible to hear every case, so he would often delegate them to a panel of justices who would rule on a particular case with his authority. There were no juries.A case usually required both parties to swear to tell the truth, plead their case before the justices, and present any evidence. If there was a conflict in the stories, it was assumed that the accused party was lying, so they would do a trial by ordeal, seeking divine guidance by throwing the accused into a river. If he/she survived, they would be deemed innocent.Also either party was allowed to appeal the verdict to the king if they felt the ruling of the justices was not fair. This concept of appeals still exists today, particularly in Anglo-Saxon law. A reconstruction of the ziggurat found at Ur. 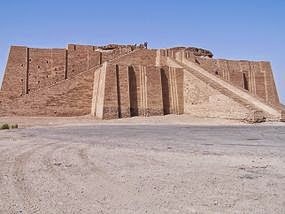 The original ziggurat was built by King Ur-Nammu in the twenty-first century B.C. and was made of mud bricks. Like many ancient people, the ancient Sumerians believed that powerful gods lived in the sky. They built huge structures, called ziggurats, with steps climbing up to the top in the center of town.Religious ceremonies were held at the very top. People left offerings of food and wine. The priests enjoyed these offerings, as the gods could not eat for themselves. the Ziggurat courtyard was gay and lively. You might see an artist painting, a boy racing by on his way to school, someone milking a cow or making a basket.These ziggurats or temple mounds were built in the shape of flattened pyramids, and appeared in most cities throughout Mesopotamia (now modern Iraq). Most were crowned with a temple or shrine where priests & people worshipped the gods of each city.The earliest ziggurat was built at Eridu in about 5000 BC. Ziggurats were solid structures with no rooms inside them. It is uncertain why they were shaped the way they were, but it seems likely that the Mesopotamians thought of them as altars or, perhaps, as stairways to and for the gods. Built by slaves, the largest ziggurats were over 45 metres high.This height, however, is just speculation, as only the foundations of this ancient monument survive today. The priests wanted their gods to keep living in their city. To do this, they encouraged the citizens to pray and bring offerings of food.The gods also owned lands that were governed for them by the priests. They collected the god's taxes practically everything was taxed in some way in Mesopotamia .These taxes were huge, requiring values to be paid depending on what one did. From trading, to fishing or farming, there was some kind of tax. Sometimes there were even a number of taxes on a single action.Because of this,one of the sumerian proverb even says:"You can have a lord, you can have a King, but the man to fear is the tax collector!" The Standard of Ur consists of four panels inlaid with shell and lapis lazuli. The two larger panels, shown here, depict scenes of war and peace. The 5000-year-old,decorated panels found buried in royal graves located in the Sumerian city-state of Ur in modern-day Iraq.The Standard continues to attract world-wide attention as one of the richest clues to Sumerian civilization in the third millennium B.C. as:government,stable food supply, social levels,specialization of labor, religion, and a culture that includes the arts and sciences. For example, the first side of the Standard, which illustrates war, shows a king being presented with prisoners captured by the king's army. The king's large size and elevated position represents his high social level and leadership in government. The large size of the king also represents the Sumerian's belief that their kings were appointed by the Gods. The soldiers driving chariots and marching reveal that Sumerian cities had strong governments that could defend themselves. The second side of the Standard illustrates peace. It shows farmers bringing the king gifts of animals and crops, both of which are proof of the city's stable food supply. A royal victory banquet is also shown, with a singer and a harpist providing entertainment. These performers reflect the presence of the arts in Sumerian culture. Items connected to various specialized occupations are shown on both sides of the Standard. For example, spears represent professional soldiers and golden cups represent artisans. The Standard of Ur is a magnificent record of Sumerian civilization and achievements. I am glad also to see that many scholars are slowly waking up to the enormous importance of Sumero Tamil studies and through that study & research they will proof to the world that Tamils are the oldest people who have established the first world civilization.